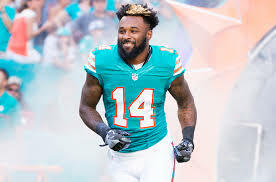 Jarvis Landry is hoping to land a new contract with the Miami Dolphins. He recently released a statement saying that he doesn’t want to be involved in contract negotiations once the season commences. Landry said that “I want to focus”. He also went on to say that “I believe that Miami is where I want to be. Miami is the place I call home. I want to be able to give my all mentally, physically and emotionally this season. Once the season starts, I just want to put all that behind me and win the Super Bowl”. In a passionate statement, Landry said, “I am comfortable in my situation. For me, I love the game so much and this is absurd to say this but you shouldn’t be paid to do what you love. I love the game that much”. He went on to say “But obviously I have people to take care of. I have a mom and a family. But at the same time. I love the game so much (the money) doesn’t even matter to me right now”. Landry is a wide receiver who was drafted by the Dolphins in the second round of the 2014 NFL Draft. He is 24 years old, weighs 92kg and currently has a 12.1 average. His base salary is less than $900,000. Considering that he is in the final year of his rookie contract, this makes him one of the most underpaid players in the NFL. Landry is adamant that he doesn’t want any distractions once the regular season kicks off. He has also said that he wouldn’t be phased if he had to play on the franchise tag in 2018. This would give him a monetary boost, however, he would also need an additional season of good health. Landry is the only player in NFL history to have 288 catches in his first three seasons. He hasn’t missed a game in his NFL career, so we’re pretty he will be able to maintain consistent production that will help him reach a long-term agreement. Landry isn’t worried about his future, instead he is focusing on the upcoming season and embracing the challenges that may arise.